Mr Casa meets with Mr Juncker. Preparations to introduce EU-wide rules granting workers at least 10 days of paid paternity leave shifted up a gear on Tuesday as MEP David Casa met with European Commission president Jean-Claude Juncker. Mr Casa, who is leading MEPs’ work on a new work-life balance directive, discussed the European Parliament’s vision with the Commission chief. As well as minimum standards for paternity leave, the directive also seeks to extend parental leave and carers’ leave rights, as well as introduce provisions for more flexible working arrangements for workers. “In Malta one of the biggest changes would be the introduction of 10 days of paid paternity leave at around the time of the birth of a child. It will allow parents to better share caring responsibilities from the very beginning of a child’s life and give fathers the opportunity to bond with their children at this crucial time”, Mr Casa said. European lawmakers including Mr Casa have been refining proposals presented by the European Commission to revamp work-life balance rules across the EU. As well introducing minimum parental leave provisions, the revised rules would also allow parents to to take parental leave in flexible forms and in a piecemeal way, and to extend its availability until a child is 12 years old. Revised rules would also see workers who care for a sick or dependant relative granted the right to at least five days of carers’ leave every year, with parents of young children and carers also granted the right to request flexible working hours to better accomodate their needs. MEPs are expected to vote on the directive in September, with Mr Casa then tasked with representing the European Parliament in negotiations with the Council of Ministers. 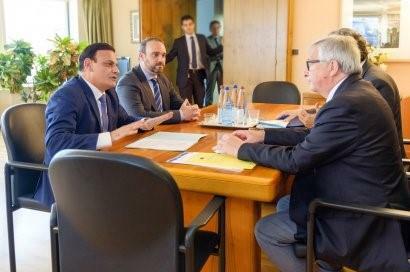 During his meeting with Mr Juncker, Mr Casa also discussed proposals to introduce EU-wide rules against SLAPP suits, to combat abusive practices intended to intimidate and silence investigative journalists. “A free press, that is protected from abuse, intimidation and harassment is a prerequisite to a properly functioning democracy. We must be vigilant in identifying emerging threats to investigative journalism and take the necessary measures to address them. SLAPP is one of those threats”, stated David Casa. David Casa praised President Juncker’s resolve to ensure the protection of journalists in the EU.